100 years since Balfour's "promise", Palestinians insist that their rights in Palestine cannot be dismissed. At the time, I had no idea who Balfour was, and how his "declaration" all those years ago had altered the destiny of my family and, by extension, my life and the lives of my children as well. The British government remains unrepentant after all these years. It has yet to take any measure of moral responsibility, however symbolic, for what it has done to the Palestinians. But the truth is, not only was Rothschild a Zionist, Balfour was, too. Zionism, then, before it deservedly became a swear word, was a political notion that Europeans prided themselves to be associated with. In fact, just before he became Prime Minister, David Cameron declared, before the Conservative Friends of Israel meeting, that he, too, was a Zionist. His successor, Theresa May, even celebrated the 100th anniversary of the Balfour declaration, 'with pride'. To some extent, being a Zionist remains a rite of passage for some Western leaders. Balfour was hardly acting on his own. True, the Declaration bears his name, yet, in reality, he was a loyal agent of an empire with massive geopolitical designs, not only concerning Palestine alone but with Palestine as part of a larger Arab landscape. The Sykes-Picot Agreement, also known as the Asia Minor Agreement, was signed in secret 102 years ago, two years into World War I. It signified the brutal nature of colonial powers that rarely associated land and resources with people that lived upon the land and owned those resources. 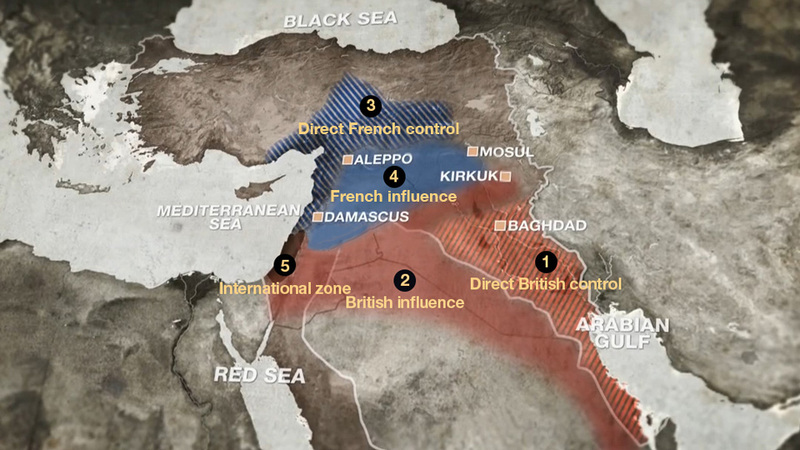 "… in the blue area France, and in the red area Great Britain, shall be allowed to establish such direct or indirect administration or control as they desire and as they may think fit to arrange with the Arab state or confederation of Arab states." The understanding among Arab leaders was that Article 22 of the Covenant of the League of Nations was to apply to Arab provinces that were ruled by the Ottomans. Arabs were told that they were to be respected as "a sacred trust of civilisation", and their communities were to be recognised as "independent nations". Palestinians wanted to believe that they were also included in that civilisation sacredness, and were deserving of independence, too. Their conduct in support of the Pan-Arab Congress, as voting delegates in July 1919, which elected Faisal as a King of a state comprising Palestine, Lebanon, Transjordan and Syria, and their continued support of Sharif Hussein of Mecca, were all expressions of their desire for the long-coveted sovereignty. In his book, Before Their Diaspora, Palestinian scholar Walid Khalidi captured the true collective understanding among Palestinians regarding what had befallen their homeland nearly a century ago: "The Mandate, as a whole, was seen by the Palestinians as an Anglo-Zionist condominium and its terms as instruments for the implementation of the Zionist programme; it had been imposed on them by force, and they considered it to be both morally and legally invalid. The Palestinians constituted the vast majority of the population and owned the bulk of the land. Inevitably, the ensuing struggle centred on this status quo. The British and the Zionists were determined to subvert and revolutionise it, the Palestinians to defend and preserve it." In his essay in Al-Ahram Weekly, entitled "Truth and Reconciliation", the late Professor Edward Said wrote: "Neither the Balfour Declaration nor the Mandate ever specifically concede that Palestinians had political, as opposed to civil and religious, rights in Palestine. That inequality continues, thus the perpetuation of the conflict. What the British, the early Zionists, the Americans and subsequent Israeli governments failed to understand, and continue to ignore at their peril, is that there can be no peace without justice and equality in Palestine; and that Palestinians will continue to resist, as long as the reasons that inspired their rebellion nearly a century ago, remain in place. One hundred years later, the British government is yet to possess the moral courage to take responsibility for what their government has done to the Palestinian people. One hundred years later, Palestinians insist that their rights in Palestine cannot be dismissed, neither by Balfour nor by his modern peers in "Her Majesty's Government". This page was first published at the 99th anniversary of the Balfour declaration and has been updated since.